ELAUSYS EVO-KNX is a KNX gateway for the Paradox EVO alarm systems. It enables bidirectional communication with the alarm system using the printer module (PRT3) from Paradox. 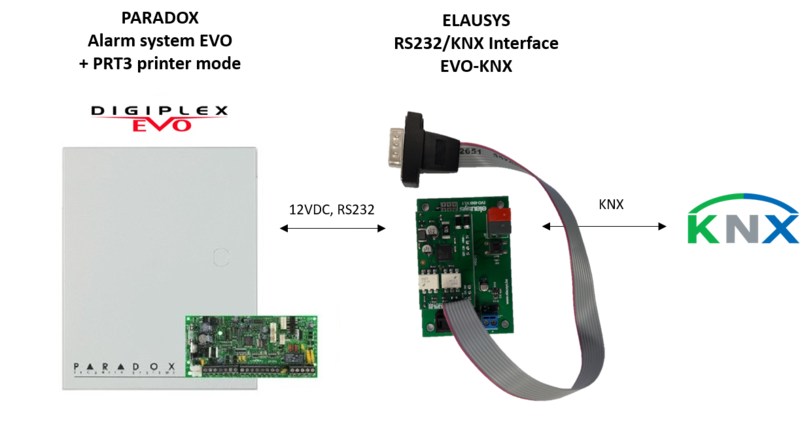 The KNX interface module EVO-KNX is a KNX gateway for the Paradox EVO alarm systems. It enables bidirectional communication with the alarm system using the printer module (PRT3) from Paradox. It allows integrators to take advantage of a fully integrated alarm system including KNX scenarios, automatic lighting using the motion detectors, arming or monitoring the system using a KNX visualization. This interface is intended to be used with a PARADOX EVO series alarm system. The system must be equipped with a PRT3 module for RS232 communication. 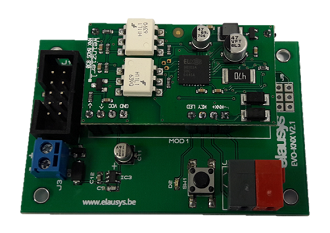 Elausys EVO-KNX module is supplied from an external 12VDC power supply which can be provided by the AUX power supply from the alarm system. 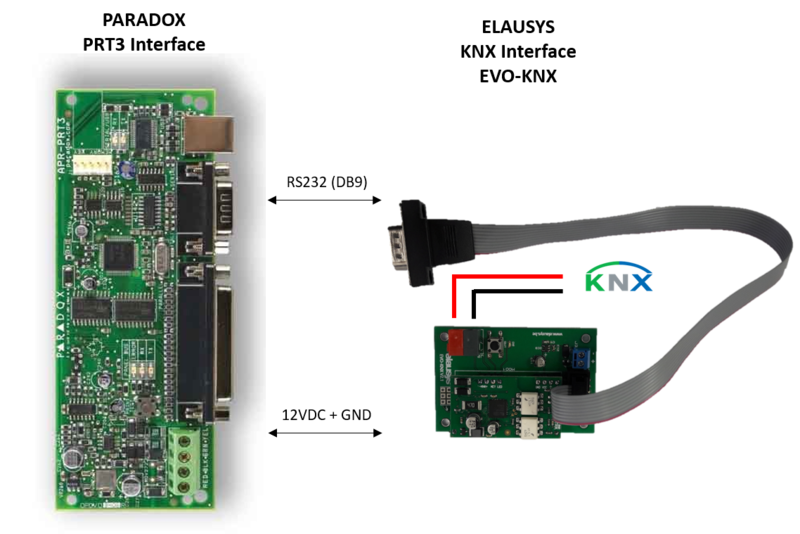 The RS232 bus must be interconnected between the PRT3 and the EVO-KNX interface using the provided DB9 connector. No additional component or wiring is required. Configuration of 15 or 30 PGM are available and will be listed in the device group objects. The status of each PGM of the Paradox alarm system is retrieved on a separate group object. Configuration of up to 96 zones are available and will be listed in the device group objects. By default, zone status is configured for zone 1 to 96 of the alarm system. A general parameter allows to change for zone 97 to 192. Having then the possibility to use two gateways in the same installation to cover the 192 zones of the alarm system. Each ZONE has 1 Group Objects (GO) for the status to KNX. Configuration of 16 virtual inputs are available and will be listed in the device group objects. Up to 4 areas can be configured and listed in the group objects. By default, areas are mapped to areas 1 to 4 of the alarm system but a parameter allows to change the area numbers to cover the areas 5 to 8 of the paradox alarm system if needed. Each area can be controlled by using the 3 group objects: Arm, Partial arm or disarm. Several statuses are available and have a dedicated group object. A scene can be assigned to each status. This scene number will be recalled each time the area status is active (ON). Each area has 12 Group Objects (GO), 3 for area control and 9 for the area status to KNX.